How Do Boll Weevils Affect Farmers? The Boll Weevil Monument, built in 1919 in downtown Enterprise, Alabama, is a testament to the damage the beetle did to the area's cotton crop as well as to farmers' ability to overcome the adversity the beetles caused. Boll weevils have historically figured in the success and failure of farmers' crops in the South. The boll weevil is a beetle whose primary diet consists of the flowers and buds of cotton plants. Boll weevils are brownish-gray and slightly fuzzy. The boll weevils' most distinctive feature is their long, prominent snouts. Boll weevils are typically between an eighth-inch to a half-inch long. Boll weevils entire lives center around the cotton plant. In addition to eating cotton buds and flowers, boll weevils lay their larvae inside cotton bolls and squares. Boll weevils can mature from egg to adult in less than 3 weeks; typically six to seven generation of boll weevils are produced every year. Boll weevils consume cotton throughout the growing season, eating the plant at every stage in its growth. Boll weevils can completely destroy a cotton crop. Boll weevils eat all the buds off the plants; they destroy any cotton that the plants manage to produce by eating and laying eggs in the cotton. In the early 1900s, boll weevils arrived in the southern area of the United States and completely devastated the cotton crops in Alabama, Georgia and some adjacent and nearby farming areas. In the past, many farmers turned to farming peanuts and other crops after boll weevils destroyed their ability to produce cotton. Modern cotton farmers take preventative measures to protect their crops from the damage boll weevils cause. Modern crop planning and specifically targeted insecticides play a large part in keeping boll weevils from destroying the yearly crops of cotton farmers. 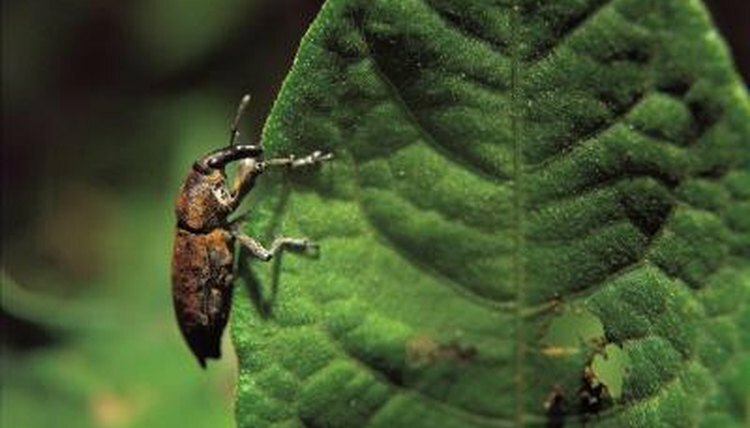 Efforts made to eradicate the boll weevil in the United States since the 1970s have been working. Many previously affected areas have almost no boll weevil population today due to the efforts to eliminate this pests.